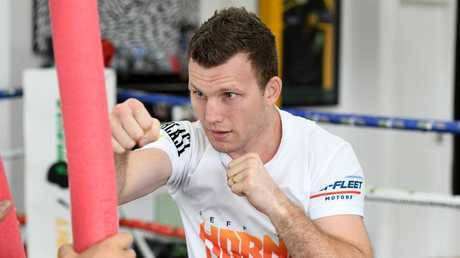 JEFF Horn is worried he will not be up to speed in a firefight with Anthony Mundine at Suncorp Stadium on Friday week and that he will get hit hard and often trying to crack his arch enemy's defence. Brisbane's former world welterweight champion has been working on a brutal body attack to baste Mundine's 43-year-old ribs and has been honing top secret strategies over the past few weeks to get past Mundine's ``shoulder-roll defence'' that is patterned on the fighting style of the great Floyd Mayweather. Still the 30-year-old fears that he will have to wear some big, fast shots as he tries to wade in. 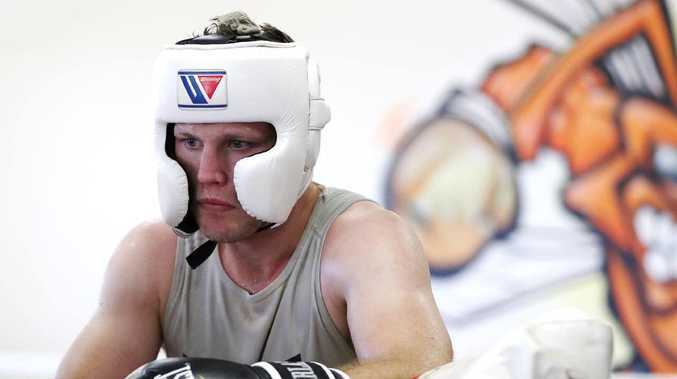 ``Mundine's defence is the thing that worries me the most,'' Horn said. "`He's a crafty veteran and still super quick. I know I have to take the fight to him and that he will be sweating on me all night to land a big counterpunch as he fights on the back foot. Mundine is motivated to win this fight like few times in his career, psyching himself up that ``The River City Rumble'' is a showcase for the downtrodden to rise against what he calls ``white privilege''. 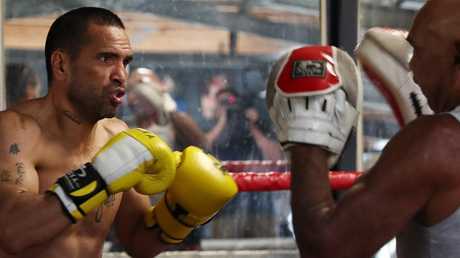 You can see the determination in Mundine's face as he trains under three layers of clothing inside the sweat box that is the Sydney fighter's adopted home - the Logan Boxing Club, a gym that looks like a big old garden shed at the back of a house in Slacks Creek. Mundine is presenting himself as the face of the oppressed and Horn as the face of middle-class Australia, a university graduate who spars inside a state-of-the-art gym at the $10m mansion of his trainer Glenn Rushton. The Logan Boxing Club has no high-tech aerobic equipment and there is no entourage watching Mundine apart from his Mum and Dad - Tony and Lyn - and cornerman Chris McCullen. 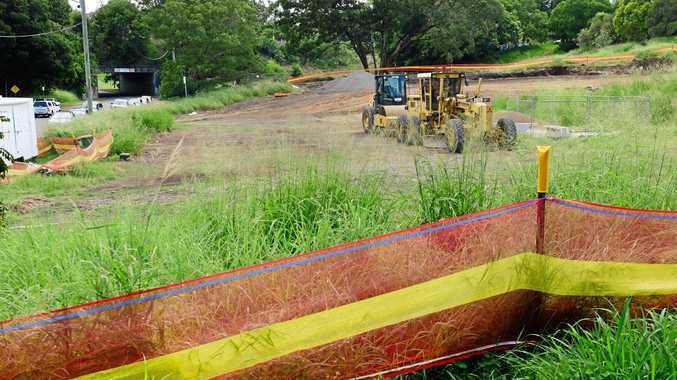 When he wants a massage after a gruelling workout, Mundine lies on the grass in front of the old gym while his father, the former world No.1 middleweight contender, gets down on his knees and goes to work on his muscles with heavy hands that knocked out 64 opponents back in the day. Horn, meanwhile, does his conditioning work at the flash Yeronga and West End gyms of fitness guru Dundee Kim and he provided a printout of a recent 90-minute session that included 10 rounds on the punching pads, six hitting the heavy bag and half an hour doing explosive body weight exercises with squat jumps, push-ups, chin-ups, dips and other callisthenics. Horn's heart rate goes from resting at 48 beats per minute to a screaming 192 over the course of the session. He burns up 1345 calories (5627 kilojoules) in 90 minutes. The fast-paced punching-pad work with Dundee involves practising combinations and side steps designed to leave Mundine hitting air as Horn darts in and out behind heavy artillery. He has contingency plans to cope with whatever Mundine brings into the ring and Mundine says he will be bringing plenty. Horn's attack remains a work in progress.